Undefeated leader Petrochimi delivered the eleventh consecutive win on Thursday night. 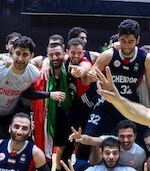 This time they crushed 8th ranked Pegah Tehran (2-9) 90-66. Undefeated Petrochimi (11-0) have an impressive ten-game winning streak. They maintain first position with a perfect record of 11 victories in a row. Newly promoted Pegah Tehran dropped to the seventh place with nine games lost. They share the position with Mashad. Bottom-ranked Raad (0-11) tried to put together a comeback for its first victory of the season, but they fell short in the 75-51 loss to second ranked Chemidor (10-1) in . But it was rather predictable considering how strong their opponent was. Chemidor have an impressive ten-game winning streak. Newly promoted Chemidor maintains second position with 10-1 record behind leader Petrochimi. Raad at the other side, also newcomer in the league, still closes the standings with 11 games lost. The game in Tehran supposed to be also quite interesting. Fourth ranked Shahrdari Gorgan (6-4) played at the court of 6th ranked Army (4-7). Shahrdari Gorgan smashed Army 81-60 on Thursday. Shahrdari Gorgan maintains fourth position with 6-4 record. Army lost third consecutive game. They keep the sixth place with seven games lost. The game in was also worth to mention about. Third ranked Naft Abadan (8-2) played at the court of 7th ranked Mashad (2-9). Naft Abadan managed to secure a 7-point victory 70-63. Naft Abadan have a solid three-game winning streak. They maintain third position with 8-2 record having four points less than leader Petrochimi. Mashad lost fourth consecutive game. Newly promoted team keeps the seventh place with nine games lost. Undefeated leader Petrochimi delivered the eleventh consecutive win on Thursday night. This time they crushed 8th ranked Pegah Tehran (2-9) 90-66. Petrochimi (11-0) have an impressive ten-game winning streak. They maintain first position with a perfect record of 11 victories in a row. Newly promoted Pegah Tehran dropped to the seventh place with nine games lost. They share the position with Mashad.